A WebmasterWorld thread asks, why is there no apparent connection between YouTube videos and Google Maps. Well, technically, there is. After you upload a video, you have an option of setting the "Date and Map Options." Here are screen captures of me editing a video, and adding the date and map data. Then fine tune the location by dragging the pin in the exact location, zoom in and select the hybrid view (if that is what you prefer). Is there a way to search YouTube location? It is not clear from browsing YouTube. But there are mapplets and gadgets you can utilize to get that information. For example this mapplet allows you to view videos by location. 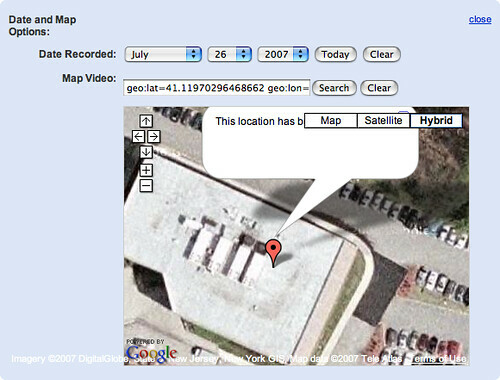 There are many mapplets and mashups that let you utilize these types of searches. 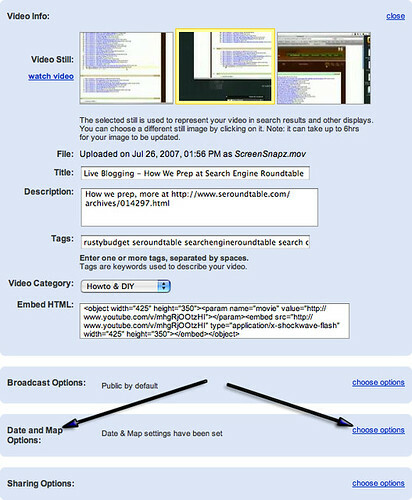 I suspect it is just a matter of time for Google to add a search by location to Google Video and YouTube (if not there already). Previous story: Are Reciprocal Links Bad? Not Quite.